Daniel Jahn was born in Hamburg and has been the coordinator for trade visitors at the HPA for 5 years. But he's been associated with the port for much longer than that. Amongst other things he has been a freelancer at the Museum of Hamburg History since 1992 and is therefore also familiar with the historical development of the port. You work for the Department of International Affairs. What does this department do? The Department of International Affairs or External Affairs is mainly concerned with representing the interests of Hamburg Port on an international level and maintaining relations with other port cities. Other important tasks are HPA's membership of international associations, the central management of trade visitors and official guests and the internal consultancy for HPA on selected legal and political questions. Whom do you take on tours of the port? I am responsible for visitors from partner ports, for international delegations, trade visitors, universities, associations and official guests from the city and the federal government. Unfortunately, I have to confine myself to this group of visitors only. As much as I would like to, I can't deal with requests from the general public. What is special about your job? You have to enjoy standing up in front of other people and showing them new things. Otherwise it doesn't work. In many other occupations, you can be successful without enjoying what you do. It evolved over the years. From a specialist interest to the experience of imparting knowledge, which I gained mainly in the museum, to an increasing number of activities at the port, which included bus rides to the container terminal. Finally, my predecessor to this job with the HPA, a seasoned captain, no less, asked me whether I wanted to apply as his successor. Which I then did – with success. Your groups of visitors are very diverse. How do you prepare for them? For groups with very particular interests, I ask colleagues for support where necessary. You might think that my job is a bit monothematic. But, on the contrary, it is incredibly varied. A port is not just an interface for people and goods, traffic and technology. All these aspects are accompanied by a multitude of very different thematic facets. 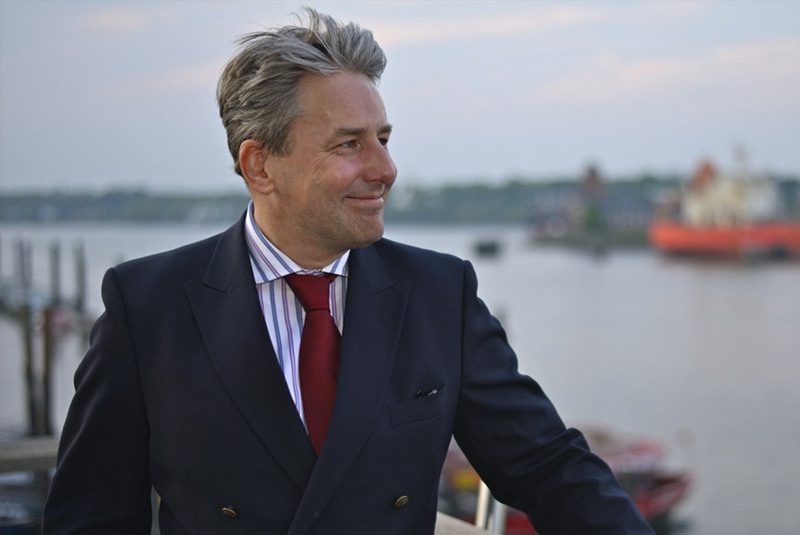 How did you acquire your tremendous knowledge of the port of Hamburg? I have always been interested in maritime logistics, port development and marine engineering from an early age. And although I have worked in many other areas during my career, I never lost this interest. Thus, over the years and decades, a considerable amount of knowledge amassed, which I am constantly deepening. What makes the port so special to you and what part of it fascinates you most? In contrast to many other ports that have grown out of the city after which they were named, Hamburg has remained a port city to this day. Port and city are intertwined. That is why, you see, it does not depend on certain places. It is more the times that fascinate me: early in the morning or late in the evening. What was your most exciting experience during the guided tours? A few months before his death, Helmut Schmidt wanted to sail through the port of Hamburg. We gladly fulfilled this wish, and of course he was allowed to smoke. He listened carefully for a long time and it was only towards the end of the journey that he asked a series of very incisive but complex questions, which I really had to think about to be able to answer. It was certainly fascinating to see this inquisitiveness and intellectual devotion to a topic in a very old man who had experienced so much in his long life. What are you asked most often and have there ever been any questions that you have been unable to answer? I am frequently asked about the future prospects of the port of Hamburg. I think they are very good, in contrast to many gloomy predictions from the media and politics. There have been occasions when I haven't known the answer to a question, albeit rarely. But it only happens once with each of these questions, because I immediately seek out the answer. What are the most exciting future challenges for the port of Hamburg in your opinion? Over the last few years, among the general public environmental awareness has increased and acceptance of industry and traffic has decreased. This makes things doubly difficult for us, because not only are we one of the largest ports in the world, but the port of Hamburg is at the same time also one of the biggest industrial areas in Europe. It is important that people in this city again realise that the port remains the guarantor of prosperity of an entire region. However, the HPA cannot do this alone. Future technologies can help to solve the problems surrounding traffic and the environment. The challenges raised by digitalisation and automation must not only be tackled, but also actively managed. But we are on the right track.